For those that use it, the IBM i platform is a workhorse of a machine, faithfully executing critical business processes day in and day out, with a minimum of fuss and upkeep. However, the long-term dependability of the IBM i platform comes with a potentially nasty side effect: technological stagnation caused by inattention and a disinclination for change. Like the old commercials for Maytag showed, reliability has a price. For the home appliance maker, the cost of above-average reliability was a lower revenue stream on the maintenance side of the business. While the manufacturers building shoddy washing machines may have charged less upfront, they had a chance to make up lost revenues through a greater number of service calls, replacement parts, and exchanges. The IBM i server bears a passing resemblance to Maytag. (In fact, our older IT Jungle readers may remember seeing the “Maytag Repairman” in a cover story in an issue of last century’s AS/400 Technology Showcase magazine that was dedicated to Maytag, a long-time AS/400 shop.) While nobody is recommending that IBM should lower its standards with the IBM i platform in order to garner more attention from technology decision-makers, there are plenty of folks who want the IBM i community to deal with that nasty side-effect of long-term success defined by complacency, inaction, and technological stagnation. Like Maytag Repairman, the IBM i server isn’t doing enough. Steve Lord, the senior product manager in charge of Ensono’s IBM i cloud business, recently helped pen a white paper, titled How to Harness Your IBM i OS for Digital Transformation, that explores some of these issues. Lord’s basic message is that IBM i shops should place a higher priority on modernizing the platform and the applications that run on it if they want to continue to be IBM i shops. Ensono operates two data centers, one in Illinois and one in Arkansas, where it runs a variety of gear on behalf of customers. That includes a collection of IBM mainframe and Power Systems servers, as well as VMware machines running virtualized Windows and Linux operating systems. It’s a partner of Amazon Web Services and Microsoft Azure, and bills itself as a one-stop shop for public, private, and hybrid-cloud computing solutions. Ensono defines digital transformation in three primary ways. First, it’s about meeting rising customer expectations. That is, customers want to deal with you and access your resources via the Web, via mobile app, and via the telephone. They might even expect you to provide text-based chat services. Secondly, digital transformation involves the capability to derive better data insights and to be able to perform predictive analysis on our customers. Whereas oil and steel were the raw materials that defined the first industrial revolution, data is the raw material that’s driving today’s digital revolution. Lastly, digital transformation means you’re capitalizing on upsell and cross-sell opportunities, Ensono says. “Today’s CIOs are really mandated to delivering information to the business better, faster, cheaper, in a meaningful way that helps sales sell,” Lord says. Ensono works with several modernization vendors, including Fresche Solutions, which develops a slew of IBM i modernization capabilities thanks to its acquisitions of BCD and looksoftware. It also works with Rocket Software, but primarily on the mainframe side, Lord says. Companies that don’t adapt to emerging technologies – who don’t transform their systems and processes in ways that customers and employees increasingly expect – risk being roadkill on the path to the digital promised land. For IBM i shops, the technological and cultural barriers may be bigger than for companies that have standardized on Windows or Linux platforms, or for those that have made the leap to the cloud. That’s not to say that digital transformation can’t be achieved on IBM i, just that the path may be more difficult. The IBM i platform is worth keeping. It can be modernized. It’s fully capable of playing a part in digital transformation, thanks to its powerful database, embrace of Web services, and user interface options. But IBM i shops need to step up to the plate and take a swing. 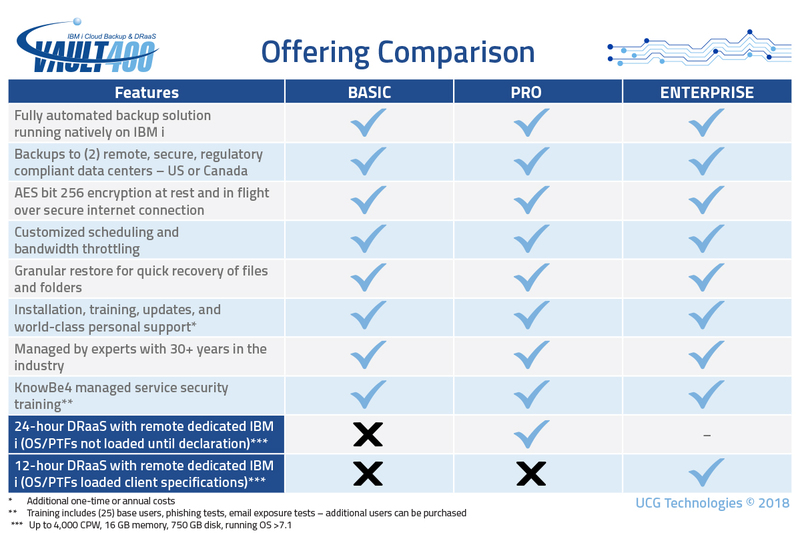 UCG Technologies builds upon recent international expansion into Canada by establishing a partnership in Latin America with CDS Americas for VAULT400 (IBM i Cloud Backup & DRaaS). 2018 is already proving to be a big year for UCG. The latest partnership with a premier partner like CDS Americas is further validation of the solution’s longstanding reputation as a leader in IBM i backup and disaster recovery. Look to see successful adoption of VAULT400 in Latin America and continued growth across all of North America in 2018. CDS Americas offers consulting services, training and software tools for a variety of technological platforms, with special focus and expertise on the IBM i Operating System. Their consultants have extensive experience with high availability solutions, delivering training courses, security solutions, operations automation, version control, modernization, performance and other solutions related to the IBM i platform for clients in Latin America.